Comodo One stores event logs from the console and Service Desk for up to seven days. The log viewer lets you view logs from both Service Desk and the Comodo One console. You can filter logs by module and event type. 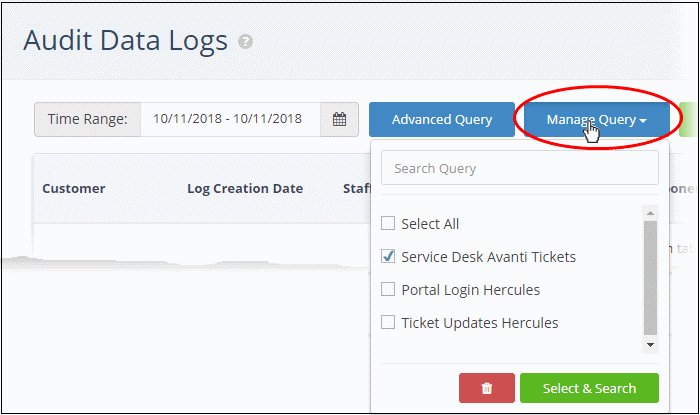 You can run simple or complex queries to view specific logs. You can also save queries for repeat searches. You can customize which columns are shown in the interface. The client company involved in the event. Note: The 'Customer' column is only available for Comodo One MSP customers. Time the log was generated. Person who executed the action described in the log. The label assigned to the event. The activity performed in the event. The following columns can be added to the table by clicking the 'Customize' button at top-right. See 'Add/Remove Columns in the Log Viewer' for more details. Additional details, if any, for the event. Click the 'Detail' link to view the value of the parameter before the change. The identifier of the admin/staff login session during which the event occurred. The identifier of the parameter that was changed. Click the 'Detail' link to view the value of the parameter after the change. You can navigate to different pages by clicking 'Next' or 'Prev' at the bottom. 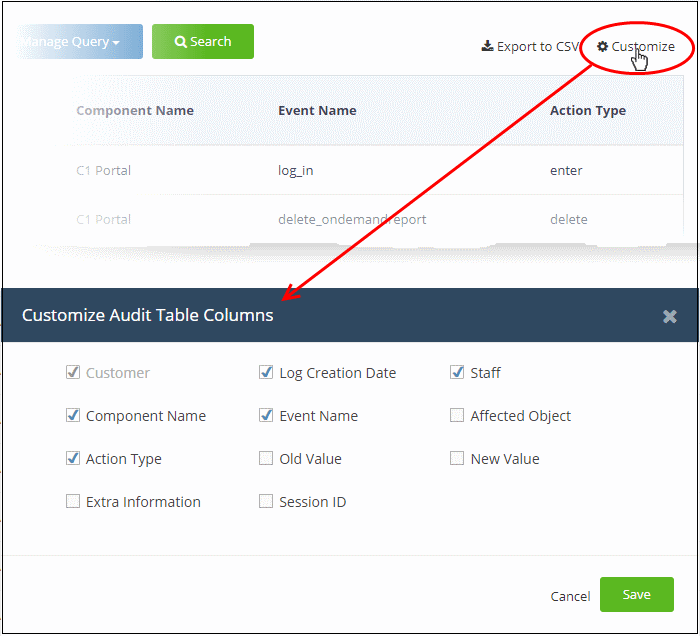 Six columns are displayed by default in the 'Audit Data Log' interface. You can add more columns if you want to view additional details. You can also hide columns that you don't want displayed. Note: Mandatory columns are grayed-out and cannot be disabled. Logs are available for up to seven days prior to the current date. Use the 'Time Range' field at top-left to choose the log display period. Custom Range - Get event logs for a specific date range. Select the start and end dates from the calendars. 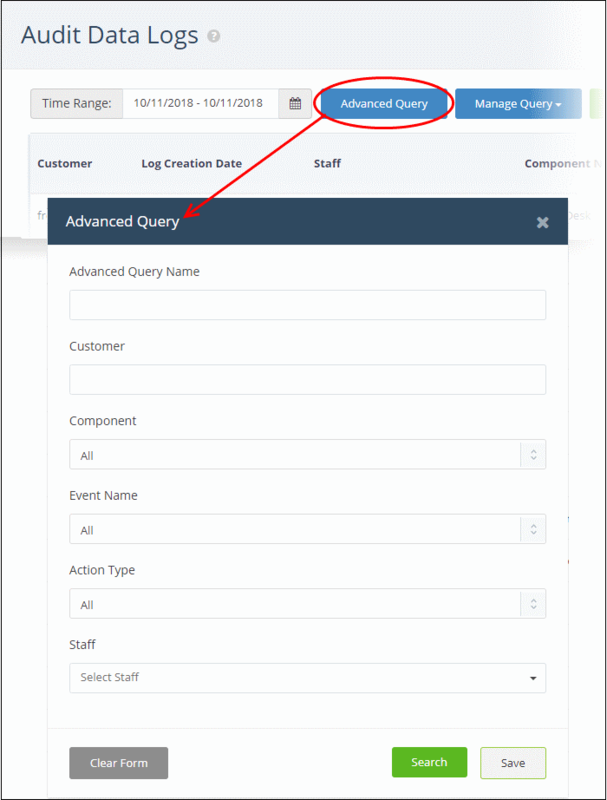 Custom search queries let you filter logs for specific events on a specific module. The query can also be saved for use in future use. The 'Advanced Query' dialog will open. Create a label for the query. Ideally this should clearly identify the purpose of the query. Search for logs which concern specific clients. Search for logs that have a specific label. Search for logs which feature a specific activity. Search for logs which involved specific personnel. 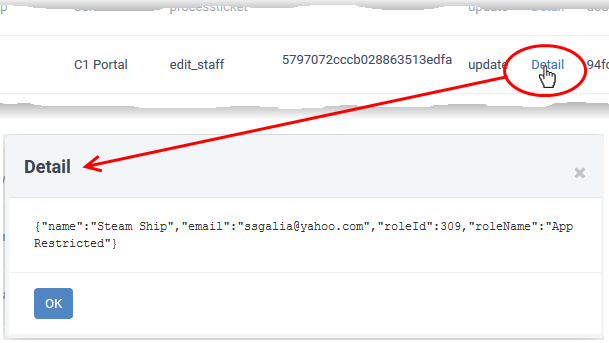 Click 'Search' to filter logs based on the conditions in your query. Click 'Save' to save the query for future use. See Use Saved Search Queries to Filter Logs	for more details. To clear an active filter, click 'Advanced Query' > click 'Clear Form' > click 'Search'. Select the queries you want to use from the drop-down. You can select any number of queries at a time. Tip: Type first few letters of a query name in the 'Search' box to quickly find a specific query. 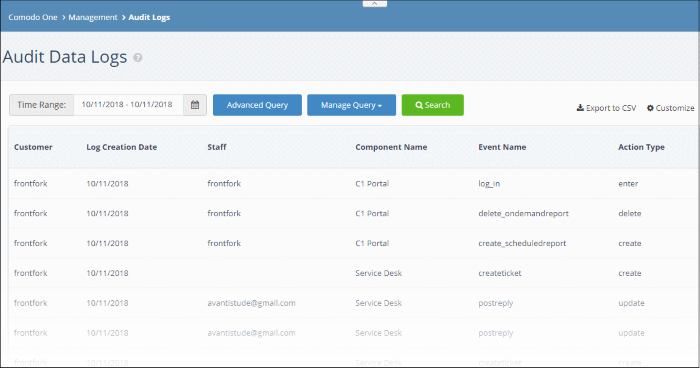 The logs will be filtered and only those meeting the search queries will be displayed. Select queries and click the trash can icon to remove them from the list. The currently displayed logs can be exported to a comma separated value (CSV) file for later analysis and troubleshooting. Click the 'Export to CSV' button. The log file will be downloaded as a .csv file. The file can be opened with spreadsheet applications like Microsoft Excel and OpenOffice Calc.